While most elementary and middle schools may host a yearly career fair, there are many ways to go beyond the career fair to keep career development at the front of our young clients’ minds! • Provide opportunities for children to imagine and explore! Dress up clothes, construction tools, doctor kits, building blocks, science kits, etc. As children play, make it an opportunity to talk about different jobs and how they use different tools. • Engage children in talking with people about their jobs. Help model questions that young children might ask to learn more about a career. Encourage them to ask questions to the custodian at school, the secretary in the front office, and safe people in their world. • Encourage children to explore more, if they show interest. Give children an opportunity to see the career in action. They may want to journal or create a project based on the career. • Explore who they are! Students this age often enjoy taking interest inventories, work values, and personality inventories! 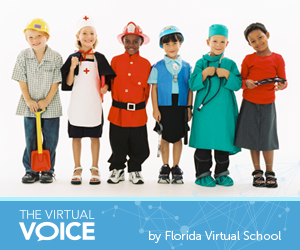 Florida Choices is a great free resource to use with students to explore who they are and where they are going! • Match students to their interests. When hosting a career fair, if possible, let students choose which presentations to attend! This will give them an opportunity to learn more about careers in which they have an interest. • Invite local college/university students to take part and share their experiences from the transition from middle/high school to college to future career. • Engage parents and teach them how to guide their children in their career development. Provide information about how to support their children by expressing interest in their children’s ideas/thoughts and encouraging them to explore and make decisions. In addition, provide local resources that help the families explore careers together. • Make the connection between school and work! Provide opportunities to volunteer and intern in the community, giving students real-life experiences. • Use social media and the Internet! Learn How to Become is an excellent website where students can search career paths; research educational options, job details, and salaries; find corresponding college/university options; and connect with additional resources and information. • Talk about and practice job skills! Host an interview day for your students. Use the opportunity to talk about professional attire, verbal and nonverbal communication, resume writing, and more! The beauty of career development is that it is with us every day! Opportunities to talk about careers can pop up at any moment! No matter the age of your child, make every day a day to explore careers! Magnuson, C. and Starr, M. 2000. “How Early is Too Early to Begin Life Career Planning? The Importance of the Elementary School Years.” Journal of Career Development, 27:2. This entry was posted in Parent Edition and tagged Career Exploration, Career Readiness, Careers, Elementary, High School, Middle School, Tips for Parents on May 30, 2014 by Anne Flenner.